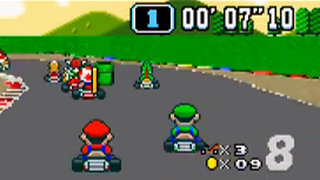 The most recent game, "Mariokart," features races between Mario and his evil brother, "Luigi," on a total of 24 Formula 1-style racing circuits. The design work for the Mariokart game software was only completed at the end of July, less than a month before the game was scheduled to make its market debut. Ten designers and programmers involved in the development of the game software worked virtually day and night for nearly one month to meet the project deadline. They certainly got the plot of the game wrong, but the rest of it, well...it's an interesting snapshot of a slightly different era of console gaming. We do love vintage stories about the making of Mario Kart games around here. Proof! I’d like to think that I made a reasonable request of the man behind Mario Kart.